The 2014 Buick Encore can be ordered with all-wheel drive, and it's a mixed blessing. It adds weight and slows down performance, but likely pays itself back when it's time to resell the car. The 2014 Buick Encore is one of very few subcompact premium crossovers, and it mostly does well in that role--but it could use more power. 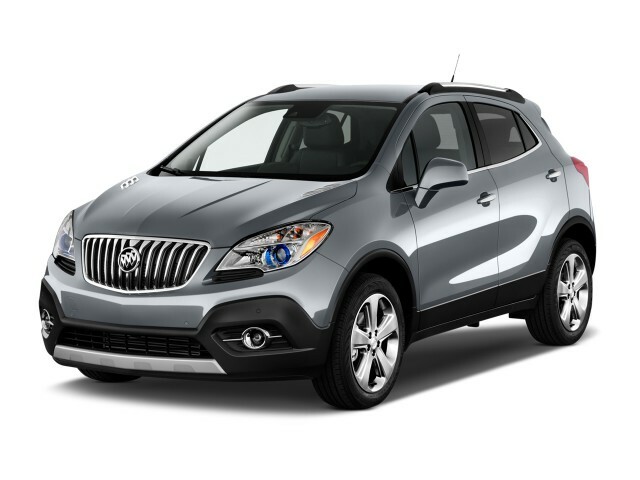 The 2014 Buick Encore is one of just a few subcompact crossovers (or tall hatchbacks, depending on which way you see it); and it's one of the smallest crossover on the market that's positioned as a premium entry. In some respects, it's in a niche of one. From certain angles, the Encore has enough presence to justify its pricetag--which can reach past $30,000 with a heavy hand on the options list. But it's hard to pinpoint exactly what the Encore competes with. 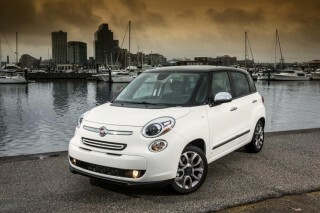 On the lower end, the MINI Countryman and Fiat 500L are smaller, quirkier, and have entirely different personalities than the littlest Buick. 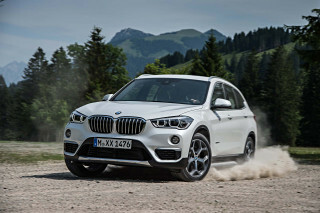 Among traditional luxury brands, only BMW offers an all-wheel-drive crossover even closer to the Encore in size--and we're skeptical that BMW X1 shoppers even know where their local Buick-GMC dealer is located. Among tall wagons that aim for good gas mileage in a practical, city-friendly size, the Buick stands alone in its more traditional approach to luxury. Buyers who want a small but luxurious car that mixes elements of hatchback and crossover, and offers all-wheel drive may find the Encore one of the few options on the market. While sales are nowhere near that of Buick's mainstay larger Enclave crossover or LaCrosse sedan, the little Encore takes the brand to a new and younger audience--and may prove to have pioneered a new market segment. The Buick Encore shares some components and underpinnings with the subcompact Chevrolet Sonic, but you'd never know it inside or out. Its optional all-wheel drive isn't available on the Sonic either--though the system is tuned for bad-weather traction, rather than off-roading or rocky country tracks. Overall, the shape of the Encore tries to convey a tougher look to disguises its tall boxy shape. The front end is steeply raked, it rides on huge 18-inch wheels, and some of the body sculpting can appear as if the designers were simply trying too hard. Accommodations are good in certain dimensions--height, particularly--and tighter in others. The Encore is a narrow vehicle, so front-seat passengers can touch elbows occasionally. Its real forte is the flexible interior configuration: The back seat flips and folds down, and even the front passenger seat can fold too. That makes it far more useful as a small hatchback than you might expect from the premium trappings, adding some Honda Fit flexibility to the Buick Verano compact luxury overtones. Inside, the cockpits of our test cars were either trimmed in all-black materials or a multi-tone palette of cocoa-colored leather and two-tone brown trim that lend a jazzy buzz. There are other color combos too. Befitting the near-luxury Buick brand, the cabin is relatively quiet--though not entirely hushed, since some wind and tire noise still comes through. Active noise cancellation does keep engine roar mostly muted, however. There's currently just one engine and transmission combination, the turbocharged 1.4-liter four-cylinder engine from the Sonic mated to a six-speed automatic transmission. (All-wheel drive is optional.) But the Encore verges on 3,200 pounds, which is a lot of mass to move with just 138 horsepower. Even without the added weight of optional all-wheel drive, the 0-to-60-mph run takes around 9 seconds, and if you add the extra weight to drive all the wheels, you'll take 10 seconds and learn to plan your on-ramps and merges well ahead of time. Handling is as good as you'll get in a tall, heavy wagon with a short wheelbase. All-wheel drive models seem to ride more smoothly than front-drivers, perhaps due to the added weight down low. Safety and equipment are where the Encore's pricetag starts to make more sense. 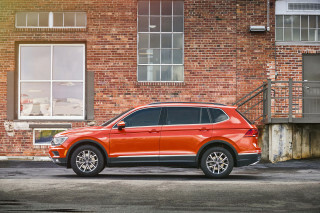 The base vehicle is around $25,000, on top of which you can add leather seats, all-wheel drive, a premium Bose audio system, and safety options like lane-departure and forward-collision-warning systems. And all models come standard with 10 airbags, a rearview camera, and the ability to run selected smartphone apps via Bluetooth. A loaded Encore comes in at around $33,000--less than the BMW X1, but a level that Buick believes puts the Encore within reach of its audience. The overstyled Buick Encore's lines may be best appreciated from head on--or from inside its quiet, well-trimmed cabin. The 2014 Buick Encore is the newest and smallest vehicle for GM's premium brand, but it struggles to carry off the styling themes of the much larger Enclave crossover and LaCrosse sedan that define Buick's new look. The Encore simply doesn't have enough surface to make its styling sufficiently detailed while looking effortless--and it doesn't. The front of the car has the big, toothy Buick grille, a tough look standing on large 18-inch wheels. There's some bulldog in the nose, along with chrome-trimmed portholes laying inconspicuously on the flat top of the hood sides (a good thing). But from the middle of the car backwards, the rakish and broad-shouldered stance morphs into a more traditional five-door small hatchback. An S-curve runs through the door panels and up around the rear glass. The rear-quarter view doesn't say "Buick" at all, but then the large, molded rear bumper shield ladles on more toughness again--and a spoiler at the top of the tailgate extends the roofline to make the short Encore look slightly longer. The interior is more successful in carrying off a premium feel in a small package. If you like the monochrome look, you can have an Encore with an all-black interior. The center stack is studded with black plastic switches, knobs, and buttons--we counted 33 of them--a bit of "wood" trim, and some metal-look accents to boot. At least Buick offers conventional rotary knobs for things like audio volume. Ambient cabin lighting is provided by blue LEDs, but Buick doesn't offer the Ford trick of changing your colors on the fly--the blue stays blue. At the other end of the scale, there's a two-tone brown interior treatment with cocoa-colored leather that will have you listening for the Starbucks jazz soundtrack and wondering about this month's special free-trade coffee blend. It's definitely an eye-opener, but for our money, it complements the Encore's quiet interior better than the austere black. 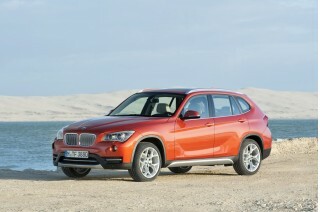 The heavy Encore simply overwhelms its 138-hp engine, especially with AWD, making it hard to enjoy its handling. The 2013 Buick Encore rides well for such a short vehicle, with good steering feel and roadholding that belies its tall-wagon shape. It just doesn't have enough power to let drivers really take advantage of those qualities. Its sole powertrain is the same 1.4-liter turbocharged four, mated to a six-speed automatic transmission, that's offered in the Chevy Sonic subcompact. 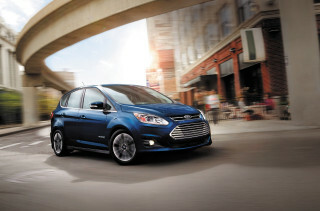 In the Encore, it's rated at 138 horsepower and 148 pound-feet of torque. 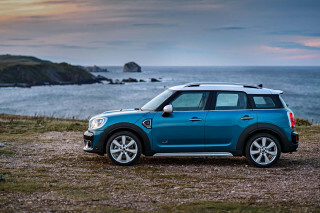 The turbo is tuned to offer peak power from less than 2000 rpm to almost 5000 rpm. The problem is that even the lightest Encore weighs almost 3,200 pounds, and adding all-wheel drive--plus passengers, luggage, and a full tank of gasoline--can push it up to the two-ton level. That means that the little turbo four has a lot of pork to move around. And to maximize fuel efficiency, the automatic is tuned to upshift quickly--meaning that to get good acceleration when you need it, it has to downshift not once but twice. In fact, we once registered the automatic having to downshift three gears to give us the power to merge into fast-moving traffic. You can do zero to 60 mph in about 9 seconds in the lightest, front-wheel-drive Encore. That goes up to 10 seconds if you add all-wheel drive, though the 150 pounds you add seems to improve the ride as well as adding traction. That AWD system is tuned to send power to the rear wheels on every launch, shifting the power increasingly to the front if there's traction up to 37 mph--by which time the Encore is being propelled only by the front wheels. Even if it's not really needed much, we suspect the AWD system will be a popular fitting in the Northeast and anywhere there's snow to be found. Despite its large 18-inch wheels, short wheelbase, and economy-car suspension design--struts up front, torsion beam in the rear--the Encore rides well under almost every circumstance. Urban hazards, from expansion joints to potholes to steel plates on the road, can cause some light chop, but overall, the littlest Buick belies its size when you're in one of its well-padded seats. The electric power steering is good, too, with the right mix of centering and simulated feedback even on the least-maintained highways. But, again, weight matters. Adding three adult men to an AWD Encore exhausts any reserve power, and we found ourselves using a heavy foot just to keep up with traffic in that case. The added avoirdupois, on the other hand, damped more rough spots in the road and improved the ride. A lone driver in a lighter front-wheel-drive Encore could make time with less effort, at the expense of a slightly choppier ride. A nice, high driving position and headroom are offset by the narrow cabin, though the Encore's flexible seats make it a useful hauler. Given its subcompact footprint, the tall but narrow 2014 Buick Encore manages to provide space for four adult-sized humans and their gear with just a few compromises. Dimensionally, the Encore is 168.4 inches in length, riding on a 100.6-inch wheelbase. That's about 10 inches shorter than a Ford Escape, but more than 6 inches longer than a MINI Countryman--though you might not be able to tell by looking at the two cars. Inside, the driver sits high, with a commanding view and good visibility out over the stubby hood. The dashboard is low, and the roof is high, which increases the sense of interior space. Even with the optional sunroof specified, there's plenty of headroom in an Encore. But the narrow cabin limits knee and shoulder room, and even though the console's not that wide, it hems in front-seat passengers--whose elbows may touch. Some may find the bottom cushions of the front seats a little flat, but the backs are nicely shaped and well bolstered. In the rear, the back seat doesn't look spacious, but it will actually accommodate two adults (don't even think about trying for a third). Kneeroom is adequate, with slight hollows in the backs of the front seats, and although wide people may rub shoulders, it's surprisingly accommodating in the rear. A fold-down armrest containing its own cupholders is a nice touch not found in many cars this small. But the Buick Encore has a second personality, as a hauler for two people and their stuff. With the back seat folded down, the 18.8-cubic-foot load bay expands to a shade under 50 cubic feet. That makes it the perfect urban errand car--and if there's only the driver, even the front passenger seat can be folded down to fit ladders, long boxes, or a whole lot of peat moss into the five-door Buick. It'll still carry cargo with refinement, though: Buick uses active noise cancellation to block out engine noises, generating white noise (or, technically, anti-noise) to eliminate the worst frequencies. There's still tire and wind noise at speed, but the cabin remains calm and soothing under circumstances that would have cheaper subcompacts howling. Less refined is the dashboard design, a welter of mixed colors, lines, and plastics. Many of the plastics are hard, but the worst aspect is the array of buttons, knobs, and other controls in the center stack. We counted 33 separate controls, many of them near-identical rectangular black buttons with small symbols on them. It's a recipe for driver distraction--or, alternatively, drivers finding the five controls they use most often and ignoring everything else the car offers. At least Buick gets points for using old-fashioned rotary knobs for things like audio volume. But the whole design hardly continues the "premium" feel conveyed by the leather upholstery and comfortable seats. Ten airbags and a standard rearview camera are commendable, but the Encore's safety ratings aren't perfect. The 2014 Buick Encore comes packed with safety technologies and 10 airbags, but its crash-test scores aren't as good as they could be. The National Highway Traffic Safety Administration (NHTSA) gives the Encore four stars out of five overall in front-wheel-drive form, though that rises to five of five for the AWD version that offers forward-collision warning and lane-departure warning systems. Both versions get five stars for front and side crash safety, and four stars for rollover safety. The Insurance Institute for Highway Safety (IIHS) rated the Buick Encore a Top Safety Pick for 2013, with its highest rating of "Good" for the moderate-overlap front crash, side impact, and roof strength tests. However, the Encore suffered a "Poor" rating in the newly added low-overlap front crash test--something that Buick may attempt to remedy in this year's Encore or in the future. The Encore comes standard with a rearview camera in every model, which is a good thing, because its side and rear-quarter vision is nothing short of atrocious. The thick door and roof pillars, rising beltline, and small rear window combine to make it almost impossible for the drive to look over a shoulder and see what's back there. The camera is a necessity. Optional equipment includes all-wheel drive, about $1,500, and camera-based safety systems that watch the road ahead and use lane markings to alert the driver if they're drifting out of the lane or closing too quickly. Some of those systems can be overly cautious, but the Encore only occasionally offered a stray beep on steep roads. Bundled with those systems is both the premium Bose audio system and parking sensors to supplement the rearview camera. Blind-spot monitors with cross-traffic alerts are new this year. The Buick Encore comes with Bluetooth connectivity as standard, and also includes GM's OnStar telematics system. It comes with six months' worth of free Directions and Connections service, plus access to a mobile app that enables destination programming, remote start, and other convenient features. Want to track family members and where they're going in the car? That's included too, on an opt-in basis. Noise cancellation keeps the Encore's cabin quiet enough to justify the premium Bose stereo; IntelliLink makes apps easy. Befitting its premium positioning, even the base 2014 Buick Encore offers plenty of standard features for its sticker price of about $25,000. 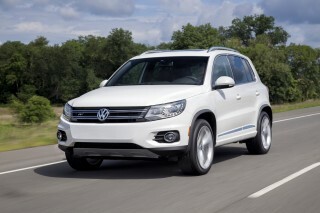 The main options are all-wheel drive, for $1,500, and then a group of packages that bundle related options together. A fully loaded Encore can almost touch $33,000. Other options include a sunroof and a navigation system that's available on all but the base Encore. The Bose premium audio system can also be specified separately on vehicles equipped with the Convenience or Leather packages. The Encore's fuel-efficiency ratings are OK, but hardly what you'd expect from a subcompact--especially if you add AWD. The 2014 Buick Encore may be small, but it doesn't deliver the fuel efficiency you might expect from a subcompact car. The Encore is rated at 28 miles per gallon combined (25 mpg city, 33 mpg highway) in its standard front-wheel drive configuration. 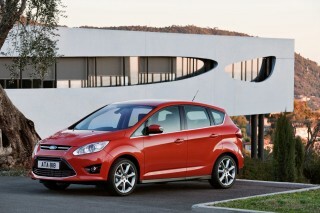 Add all-wheel drive, however, and that falls to 26 mpg combined (23 mpg city, 30 mpg highway). Buick says the Encore earns the best gas mileage ratings for any crossover from a domestic carmaker. That may be true, but it leaves out the Subaru XV Crosstrek, which matches the Buick with a combined rating of 28 mpg. 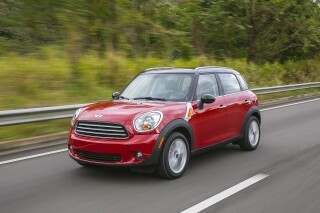 Buick points to the MINI Countryman, at 27 mpg combined, or the Volkswagen Tiguan, at 23 mpg. We'd also suggest the Nissan Juke, rated at 29 mpg combined--or 27 mpg with all-wheel drive--although in our experience, the all-wheel-drive Juke returned significantly lower real-world mileage than its rating. My 2014 Encore is great! except if I don't drive my car for a week,my battery goes dead. Very good MPG. Very very quiet inside. Lots of head room and great handling. My Encore is very comfortable and I Love the Leather Seats and Sun roof! !